The boom in mass media science fiction and science fact occurred at about the same time as an extraordinary proliferation of pro-space groups, concentrated in the years from 1978 to 1982. Until the late 1970s, the older professional and industry groups — plus the National Space Institute and the L-5 Society — had the field largely to themselves. From 1977 through 1980, space interest groups were formed at an increasing rate all over the United States (Figure 0.1). This surge of group formation appears to have continued at a declining rate through 1984. These roughly simultaneous phenomena — the changing demography of pro-space attitudes, the rising interest in space-related science fiction and science fact, and the formation of pro-space groups — may be interrelated. The principal chronicler of this space group boom is science writer Trudy E. Bell, who first called attention to it in articles published in the fall of 1980 (a revised version, reaching a larger audience, appeared in Omni in February 1981). Using as her principal criteria nationwide activities or intentions (with the addition of a few of the most important local groups having widespread activities), Bell found that, as of May 1980, there were 39 American space interest groups (this later was raised to 42). If all local chapters and independent local groups had been included, the number would have risen to about 100. Adding on other groups with a positive attitude toward space, such as professional and amateur astronomical societies, science fiction clubs, and certain technical societies, would have brought the number of pro-space or space-sympathetic organizations to about 500. Thus Bell’s list of 39 represented the bare minimum of organized space interest. Dividing the 39 primary space interest groups into two main categories, Bell found that citizens support groups had about 40,500 members as of May 1980 (later revised to 33,800), and that trade/professional groups had about 39,500 (later revised to 47,000). This gave an initial total of 80,000 members, later revised to 80,800. The citizens support groups had an estimated total budget of over $4 million (the figure for trade and professional groups, about $10 million, is far too low because the Aerospace Industries Association declined to reveal its budget). Bell noted that the citizens groups’ budgets did not include the value of volunteer labor and access to borrowed or donated equipment. As a measure of geographic distribution, Bell used the locations of group headquarters. One third were based in Washington, D.C., and another third in California; the rest were scattered across the United States. Washington, D.C., with four of the seven trade/professional groups, had been a home for space interest groups for many years. California, by contrast, emerged as a center for pro-space citizens activist groups only after 1977. Bell did a second survey in 1982 (it was to have been published in the second volume of the Space Humanization Series put out by the Institute for the Social Science Study of Space, but had not appeared as of 1985). She found that the number of space interest groups with nationwide activities or intentions had increased to 50. Ten of the groups listed in 1980 had disappeared; 4 merged with others, 2 became defunct, and 4 could not be traced. Bell noted that most of the citizen support groups which had grown to have some influence were two to seven years old, suggesting some stability. As of July 1982, the aggregate membership of these space interest groups had risen to just under 250,000. While trade and professional groups had grown by a respectable 15 percent, citizens groups had quadrupled in total size. The Planetary Society, which then had about 120,000 members, accounted for fully half of what Bell called “the formal space constituency.” Other large groups were the American Institute of Aeronautics and Astronautics, the National Space Institute, the L-5 Society, and the Space Studies Institute. Allowing for overlapping membership, Bell estimated that between 150,000 and 200,000 people belonged to space interest groups in mid-1982. The number of people with a strong interest in space almost certainly is much larger, since formal memberships normally are only the tip of an interest iceberg. Subsequently, the numbers rose further, primarily because of the growth of the new American Space Foundation, which claimed 22,000 members in the spring of 1984. Budgets had risen also, to an aggregate total of more than $23 million. This does not include the Aerospace Industries Association or the World Space Foundation, which declined to provide figures. Again, Bell pointed out that a number of active and influential groups, such as Spaceweek Inc. and the Chicago Society for Space Studies, had formal budgets that were deceptively low because they did not necessarily reflect the value of donated services, volunteer labor, or access to facilities such as photocopy machines. Conversely, some of the newly formed groups appeared to be projecting unrealistically high budget figures. Groups in the first category, in Bell’s view, function much like typical astronomical societies with meetings, lectures, and other public events to promote awareness of space. The last three types of space interest groups, which aim to turn awareness into action, were virtually all under three years old in 1980. It is this turn toward building hardware, funding research, and lobbying that made the new pro-space “movement” different from existing space interest groups. Nathan C. Goldman and Michael Fulda have noted that the advent of more purposive groups may have limited the future for such a generalized group as the National Space Institute. In her 1982 study, Bell noted the advantages of a typology suggested by veteran space activist Stan Kent. According to Bell, Kent sees space groups divided into three “arms” of the space movement: (1) the talking arm, (2) the doing arm, and (3) the political arm. In the sections below, only the most significant organizations are described. A more complete list is in Appendix A. One of the criticisms sometimes directed at the pro-space movement is that it is largely a male enterprise, generally shunned by women. After the first flight of the Space Shuttle, Amy Marsh and Marita Dorenbecher founded the Hypatia Cluster in San Francisco in May 1981 to motivate other women to participate in space science and to support space exploration, with the hope of getting more women into policy-making positions in the space field. According to Hypatia activist Mickey Farrance, a systems engineer with Lockheed Corporation, the name was inspired by Carl Sagan’s treatment in “Cosmos” of the famous female scholar Hypatia, who directed the great library at Alexandria, Egypt. Sagan reportedly included this material at the urging of his wife, Anne Druyan, who is a member of the Hypatia Cluster’s Board of Advisers. Other board members include science writer Richard Hoagland, Barbara Marx Hubbard, Stan Kent, space arms control activist Carol Rosin, and veteran space activist David C. Webb. More of a network than a formal organization, Hypatia conducts courses and workshops and encourages young people to prepare for space careers. One of the most interesting and successful of the grass-roots space interest organizations, Spaceweek grew out of a 1979 effort in Houston to commemorate the tenth anniversary of the first Moon landing. (David C. Koch, who played a major role in starting Spaceweek, went on to found the American Society of Aerospace Pilots in 1981.) Not a membership organization, Spaceweek provides guidance and information kits to other groups organizing events in July of each year to celebrate space achievements. Spaceweek programs, organized by unpaid volunteers, spread from two cities in 1980 to 100 cities in 1983. The local committees that organize Spaceweek programs often are composed of members of the L-5 Society, AIAA, and other pro-space groups, who work together to present lectures, exhibits, and films, and to get materials into the media. Spaceweek headquarters in Houston, which operates on a shoestring budget, gives local committees virtually complete autonomy, much in keeping with the ethos of the new space movement. Spaceweek President Dennis Stone, a pleasant, articulate young engineer who moved from Ford Aerospace in Houston to NASA’s Johnson Space Center in 1983 to work on Space Shuttle payload integration, is the linchpin of the operation. The Aerospace Industries Association and the GEOSAT Committee already have been described. One organization in this category that emerged during the space interest group boom was the Sunsat Energy Council (1978), founded by Peter Glaser and others to support the solar power satellite concept and to foster research into that idea. Sunsat began to publish Space Solar Power Review and Space Solar Power Bulletin but appears to have been inactive since funding for further satellite solar power station studies was defeated in Congress in 1980. The nonprofit interests category exists essentially because the Public Service Satellite Consortium, described in Chapter 2, does not fit in any of the others. Made up of a number of nonprofit member organizations, the PSSC is not a typical economic interest group nor a typical educational organization. We already have looked at the older professional organizations in the aerospace field: the AIAA, the American Astronautical Society, the Aerospace Education Association, The Aviation/Space Writers Asso­ciation, and the IEEE’s Aerospace and Electronic Systems Society. The early 1980s saw the creation of two others of interest. Several groups were founded in the late 1970s to provide alternatives to federal funding for space-related research. (Bell notes that funding research and development through contributions from citizens repeats the pattern of the 1840-60 American observatory-building movement.) Gerard O’Neill’s Space Studies Institute is in part a funding organization for research. The other principal groups are discussed below. Growing out of discussions between University of California at San Diego space scientist James Arnold and Scripps Institute of Oceanography Director William Nierenberg, CalSpace was pushed through the California legislature in 1979 with the help of former astronaut Russell Schweickart, who had been an adivsor to Governor Edmund G. (Jerry) Brown. A statewide research unit of the University of California, CalSpace is headquartered in a white frame house idyllically located atop a seaside cliff in La Jolla, north of San Diego. The organization supports space research with an emphasis on practical applications. Its main areas of concentration are remote sensing, long-range weather forecasting, the production of energy and materials from space, and pure space science research, especially astrophysics. CalSpace, which received $900,000 from the State of California during its first full year of operation, provides “seed money” to university researchers for projects. As of 1984, the institute had three staff members who also do research themselves: (1) Director James Arnold, who is a long-time advocate of mining lunar and asteroidal resources; (2) “idea man” David Criswell, who has produced a wide variety of concepts for space industrialization; and (3) young, aggressive Executive Director Stewart Nozette. According to Nozette, CalSpace hopes to branch out into related scientific and technological fields, with an emphasis on those that will have an economic payoff. Nozette, who learned some of his lobbying techniques from Leigh Ratiner, comments that making the institute a part of the university gives it a legitimacy that some other organizations lack. CalSpace hosts conferences on space-related subjects, including one on low-cost approaches to space industrialization. In 1979, members of the San Francisco section of the American Astronautical Society launched a “Viking Fund,” which raised over $100,000 to help keep going the flow of data from the Viking landers on Mars (“Feed a Starving Robot,” said the advertisements). The first $60,000 was turned over to a somewhat bemused NASA in a public ceremony in January 1981. The leader of this effort was English-born space activist Stan Kent, who came to the United States to get involved with the space program. Kent formed Delta Vee (a term having to do with the amount of energy needed to change the trajectory of a spacecraft), an unusual form of corporation whose “stockholders” were its contributors. He and Van R. Kane launched a Halley Fund — an appeal to support a Halley’s comet mission, which the Carter administration declined to approve. After Senator William Proxmire ended NASA funding for a radio search for extraterrestrial civilizations, Kent and Kane also launched an Extraterrestrial Connection Fund to help finance public and private radio searches. When the magazine Cosmic Search, the only American publication devoted to the search for extraterrestrial intelligence, went out of business, Delta Vee started a successor magazine called Astro Search. That, too, has since folded. Delta Vee, based in northern California’s “Silicon Valley” area, appeared to be inactive as of 1984. The oldest of these groups, the Radio Amateur Satellite Corporation (AMSAT) is an organization of radio amateurs (“hams”) who design, build, and operate the series of satellites called OSCAR (Orbiting Satellite Carrying Amateur Radio) for experimentation and message relay by radio amateurs and amateur scientists. The first satellite, OSCAR-1, was built in California workshops for $65 and piggy-backed into space on a military satellite launch in December 1961. The Californians formed a group called Project Oscar, which still exists on the West Coast. AMSAT, formed in the Washington, D.C., area as the East Coast analog of Project Oscar, has grown to 6,000 members. Although most are in North America, AMSAT is an international organization with chapters and affiliated groups around the world. Eleven satellites had been launched as of 1984. The OSCAR program is now in phase 3 (high Earth orbit) and is aiming for phase 4 (quasi-geosynchronous orbit). In the latter part of 1979, three students at the Rensselaer Polytechnic Institute in Troy, New York, heard about the “Getaway Special” canisters in which private groups could send payloads into orbit on the Space Shuttle (former NASA official George Low was president of Rensselaer until his death in 1984). The students got the idea of building a six-inch diameter amateur astronomical telescope that could observe from space. After hearing about AMSAT, they expanded their horizons and founded the Independent Space Research Group (ISRG) as a membership organization in the spring of 1980, with the purpose of designing, constructing, and operating a series of increasingly advanced astronomical satellites for serious amateur astronomers, students, and professors. The group’s main project is the Amateur Space Telescope, an 18-inch reflector that will orbit independently, perhaps as early as 1987. Although the ISRG wants to do real science, it hopes to design the system so that images can be picked up on home televison sets connected to amateur radio equipment, thereby widening participation. AMSAT is to help track the satellite. As of 1984, the ISRG had hundreds of members in more than 20 countries and was having work done by optical experts in Rochester, New York, as well as by students and faculty at Rensselaer. ISRG President Jesse Eichenlaub points out that such projects can be done very cheaply by using volunteer labor, donated equipment, and existing technology. The ISRG’s Ronald Molz is the chairman of the Independent Space Research Projects Committee. As long ago as 1975, young aerospace engineer Robert L. Staehle was hoping to establish a practical way for people to express their enthusiasm for space. He joined the Jet Propulsion Laboratory in 1977, the year NASA suspended research into solar sailing, an aesthetically attractive form of space propulsion in which spacecraft would be driven by the impact of energy from the sun on large, thin sails stretched before them. In January 1979, Staehle and some of his colleagues formed the World Space Foundation (WSF). Two months later, the WSF began working with a group at the University of Utah doing research on solar sailing. A half-scale model of a solar sail was displayed at the Planetary Society’s “Planetfest” in Pasadena in August 1981, and a full-sized prototype was completed in WSF’s Pasadena workshop in 1983. The group hopes to launch an engineering development model of the sail from the Space Shuttle or the European Space Agency’s Ariane launcher in 1987 or 1988 and to someday use a sail to propel a mission to an asteroid. (A French group, following up on an idea in a story by Arthur C. Clarke, is advocating a solar sail race to the Moon.) The project received a boost when the Hughes Aircraft Company donated a rocket motor that will propel the sail from low Earth orbit to higher altitudes, where it will function more efficiently. The WSF, which received early help from the Charles A. Lindbergh Fund, collaborates on this project with the Jet Propulsion Laboratory, AMSAT, the University of California, the Technical University of Munich, and the Popular Astronomy Society of Toulouse. The WSF, with the help of the Planetary Society, also supports a search by astronomer Eleanor Helin and her colleagues for asteroids that approach or cross the orbit of the Earth. That group already has discovered almost half the known near-Earth asteroids, which may be the most desirable sources of extraterrestrial materials for space industrialization. As of February 1984, the WSF had 40 to 50 volunteers, supported by a much larger but undisclosed number of subscribers. The group periodically publishes Foundation News and a series of papers intended to make up a Foundation Astronautics Notebook. Inspired by the 1984 poll that showed that 45 percent of Americans wanted to fly in the Space Shuttle, the WSF launched its “I want to GO” slogan and planned to publish a book entitled Why America Wants to Fly the Shuttle. One of the features that distinguishes the new space movement from its predecessors is the formation of organizations explicitly intended to lobby for space or to exert related influences in the political arena (for example, through political action committees). Some groups, notably the L-5 Society and small, temporary operations like the National Action Committee for Space, had engaged in lobbying in the late 1970s. Beginning in 1980, politically oriented groups suddenly began to sprout. These included Campaign for Space (1980), Spacepac (1982), and the American Space Foundation (1982). A related phenomenon was the formation of the Congressional Staff Space Group and the Congressional Space Caucus in 1981. These political arms of the pro-space movement will be examined in Chapter 9. 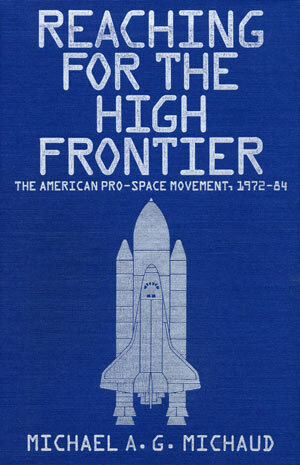 In the late 1970s and early 1980s, groups began to be formed to advocate space-related defense concepts (for example, High Frontier and its political arm, the American Space Frontier Committee), to oppose such concepts (for example, the Progressive Space Forum, the Institute for Space and Security Studies, and the Institute for Security and Cooperation in Outer Space), or to advocate a new space-based world security system (War Control Planners, Strategic Arms Control Organization). These groups will be described in Chapter 11. This catch-all category includes some small, highly specialized interest groups with a space-related theme. Examples are Save the Apollo Launch Tower, a conservation-minded group that wants to preserve the rusting structure from which the Moon landing missions were launched, and the International Society of Space Philatelists, a stamp-collectors group. This was not all. There were earlier groups that had gone out of existence by 1980. There were small private companies started by space enthusiasts (see Chapter 11). And there was the publication Space Age Review, based in San Jose and founded by peace activist Steve Durst. Although that publication folded, the Space Age Review Foundation survived and started the useful publication Space Calendar, which was still in business in 1985. Of the California groups on Bell’s lists, nine were in the San Francisco Bay-Silicon Valley area, seven were in Los Angeles, two were in San Diego, and one was in Santa Barbara. The combination of aerospace industry activity and concentrations of educated, technology-oriented young people appears to have provided fertile ground for space group formation. Jim Heaphy, leader of the Progressive Space Forum, observes that in 1979 one could joke about “the space group of the week” in California. One key element in the California space group boom may have been the enthusiasm of California Governor Edmund “Jerry” Brown, who appears to have been “converted” at least partly through the efforts of Coevolution Quarterly publisher Stewart Brand and ex-astronaut Russell Schweickart, both of whom were advisers or consultants to the governor at one time. Brown was the principal speaker at an August 11, 1977 convocation in Los Angeles known as “Space Day,” which was attended by aerospace executives, media people, and space enthusiasts. Organized by Schweickart, the meeting was cosponsored by the state and the aerospace industry. (New Times magazine reported that Rockwell International Corporation, prime contractor for the Space Shuttle, paid the bill.) Space Day was held the day before the first Space Shuttle “drop test,” when the orbiter was released from its Boeing 747 carrier to glide to a landing in the California desert. When the day of manufacturing in space occurs and extraterrestrial material is added into the economic equation, then the old economic rules no longer apply. Going into space is an investment . . . through the creation of wealth we make possible the redistribution of more wealth to those who don’t have it. . . . As long as there is a safety valve of unexplored frontiers, then the creative, the aggressive, the exploitive urges of human beings can be channeled into long-term possibilities and benefits. But if those frontiers close down and people begin to turn inward upon themselves, that jeopardizes the democratic fabric. . . . As for space colonies, it’s not a question of whether — only when and how. Space Day was followed up by Space Day Two, organized in the San Francisco Bay area in April 1978 by the “April Coalition,” which, according to a February 1978 press release, was to bring together the following constituencies: “non-nukers,” “human rightists,” “radical ecologists,” and “spacers.” Pro-space groups in the April Coalition later formed the Futurian Alliance. One of the organizations involved in creating this coalition was United For Our Expanding Space Programs (UFOESP), noted in Chapter 5. Some of the groups had a leftist flavor, and Heaphy recalls that the annual Space Days became “classic counter­culture rallies.” By 1980, Space Day drew 2,000 to 3,000 people in San Francisco’s Golden Gate Park. The April Coalition/Futurian Alliance represented, in space activist Tim Kyger’s words, one “tree” of organized space activism in the bay area. (Kyger, a space enthusiast and science fiction reader whose father was in the Air Force, had come to the bay area in 1979 from Arizona.) The other was the L-5 “tree,” beginning with the L-5 Society chapter organized at the University of California at Berkeley in 1977 by David Brandt-Erichsen and others. Other L-5 Society chapters were formed, moved, merged, died, and reborn and interacted with the other organizational “tree.” After 1980, says Kyger, the groups in the bay area began to drift apart, but many of the individuals involved showed up at the L-5 Society’s convention in San Francisco in April 1984. Meanwhile, space enthusiast Joseph “Jay” Miller, leader of the San Francisco Space Frontier Society (a former L-5 chapter), had launched an unsuccessful campaign for a California Astronautics and Space Administration. L-5 Society and related groups also sought the establishment of a space museum in Los Angeles. After the election of Ronald Reagan, several bay area space groups met in San Jose in January 1981 to draft a joint statement on space policy, but the result was a bland compromise. The groups also failed to form a coalition that could join the National Coordinating Committee for Space as one organization. In 1983, space activists scored a success when the California legislature passed a joint resolution, pushed by State Senator Art Torres and his aide Jay Miller, urging the President to initiate a manned space station. Since Bell’s 1982 research, the political action-oriented American Space Foundation, described in the next chapter, has joined these groups with a claimed membership in early 1984 of 22,000. However, most citizens groups numbered in the hundreds or less, and some were little more than mailing lists; some groups had contributors rather than members. During 1979, several people saw a need to try to bring pro-space groups into a coalition to allow the “movement” to speak with one voice and to make it more effective politically. The most important experiment in cooperation began that year when leading figures of the AIAA, the American Astronautical Society, the National Space Institute, the L-5 Society, Campaign for Space, and other organizations started getting together informally under the name Ad Hoc Coordinating Committee on Space. Among the individuals active in trying to bring the groups together were Jerry Grey of the AIAA, Ben Bova, then with Omni, and space activist and organizational entrepreneur David Webb. This Ad Hoc Committee evolved into the National Coordinating Committee for Space (NCCS). Meanwhile, political scientist Michael Fulda, who had been active in getting a space plank into John Anderson’s 1980 Presidential campaign platform, unsuccessfully proposed a national conference on space advocacy, with Webb’s support. Although that conference never took place, the NCCS held its first formal meeting in Washington, D.C., on June 17, 1981, two months after the first flight of the Space Shuttle. As of August 7, 1981, the NCCS Steering Committee consisted of National Space Institute Executive Director Mark R. Chartrand III, Planetary Society Executive Director Louis D. Friedman, AIAA Public Policy Administrator Jerry Grey, American Astronautical Society President Charles Sheffield, and David Webb of Campaign for Space. (Notably absent from this list was the L-5 Society.) The National Space Institute agreed to act as the secretariat for the NCCS. Membership criteria and procedures of operation were established. Meetings were to be held at quarterly intervals. The President should formally recommit the United States to a vigorous and leading national space program. A high level and broadly based space policy task force should be appointed. NASA’s mission should be clarified. NASA must have increased, stable, and reliable funding for well-chosen initiatives. National space policy should promote the entrance of private enterprise into all segments of civilian space activity. This statement was very general, reflecting the diverse interests represented in the NCCS. The document avoided endorsing specific hardware projects, saying only that NASA funding “should allow for a more vigorous pursuit of high orbital capabilities, astrophysics, planetary science, materials processing, biomedical research, robotics, and technology for both manned and unmanned missions.” This gave something to each of the major sectors of the pro-space community, notably the space developers and the space scientists. However, Victor Reis, then handling space policy issues for the White House Office of Science and Technology Policy, believes that the statement had no effect on national space policy. According to Bell, the NCCS grew to include 33 member groups, including more than two thirds of those in her 1980 directory. However, momentum was lost over the next year; the NCCS met with decreasing frequency for the rest of 1981 and 1982 and produced few agreed statements. By the time of Bell’s 1982 survey, membership had declined to about 18 groups. After November 1982, the NCCS did not meet again for a full year. The NCCS was revived at a meeting in Washington, D.C., in November 1983, attended by representatives of 18 groups. There was considerable discussion of a possible new space initiative by the Reagan administration, but no agreement was reached as to what that should be. As Chartrand was leaving his post as NSI executive director, he was replaced as NCCS chairman by David Webb, who seemed more inclined to use the NCCS as a vehicle for statements on space policy. Under Webb’s leadership, NCCS participants in Washington met over the next few months to develop a stance toward the expected Reagan administration space station initiative, discussed in Chapter 13. By mid-1984, with the first year of space station funding approved by the Congress and Webb working on a study related to space commercialization, the organization once again seemed inactive. egoism) of each group as a part.” These were among the reasons that the NCCS never was politically effective. After their early 1980 tour seeking funds for the L-5 Society, lawyer-lobbyist Leigh Ratiner and L-5 President Gerald W. Driggers saw the need for a different mechanism. Driggers recalls that his concept was to pull the aerospace community together behind some objective. Seeing many pro-space groups with slightly different objectives, Driggers wanted to form some kind of federation. was created pursuant to the L-5 Society’s Board of Directors discussion in Lincoln, Nebraska [April, 1980] for the purpose of carrying out the legislative action functions required to implement the 5 year strategy and plan of action. It is intended that the L-5 Society will be the center for conducting the public information and educational activities described in the program, while the Space Coalition will be the center for lobbying and related activities. Ratiner believed that the initial focus of the Space Coalition should be a manned space station, a position that agreed with that which Driggers had taken after he became president of the L-5 Society at the end of 1979. If the space station effort proved to be successful, the organization would come back with a larger agenda. It was hoped that the coalition would get support from other citizens groups in addition to the L-5 Society. The Space Coalition is intended to be a broad-based alliance of citizens, industry, and associations involved in the space movement. . . . During its initial operation, the primary (but by no means the only) emphasis in its activities will be to mount a lobbying campaign for a new United States manned space station program. . . . It is our intention that both L-5 and NSI join the new organization. . . . The chief advantages we see in the proposed collaborative effort are the opportunity to launch a new space lobbying capability, with immediate access to a large citizen membership base, and the chance eventually to minimize administrative expenses through sharing facilities, and possibly staff personnel. The formation of The Space Coalition is the most important step taken in the history of the pro-space movement. This organization makes it possible to rally the resources necessary to speak with a unified voice in Washington, and, ultimately, in all the major capitals of the World. It is up to us to take the initiative. The long-term prospects for large-scale habitation of space are totally dependent on the success of the Space Coalition in achieving the results discussed above. Meanwhile, Ratiner had been approached by New York businessman Robert E. Salisbury, who wanted to play a role in the pro-space cause. Salisbury and Hubbard provided funds that allowed Driggers to move to Washington for the summer of 1980 to work full-time out of Ratiner’s office, promoting the coalition. Salisbury was elected chairman of the Space Coalition in December 1980, with Driggers as president. The other two initial directors of the coalition were G. Harry Stine and ex-astronaut Philip K. Chapman, who later became president of the L-5 Society. Meanwhile, a gap was growing between the coalition and some L-5 board members who did not support the new venture or who wanted more L-5 control. Driggers became increasingly disillusioned. Seeing that this was not “coming together,” Ratiner said the Space Coalition would go ahead on its own and offered to have it serve as the lobbying arm for a loose coalition of space organizations. Nothing came of this. As of April 1981, the Space Coalition was describing itself as “a not-for-profit advocate for accelerated systematic space development.” Its board of directors by then consisted of Professor James R. Arnold of the University of California at San Diego; Philip K. Chapman of Arthur D. Little, Inc.; Gerald W. Driggers and Marne A. Dubs of the Kennecott Corporation; Thomas 0. Paine, Robert E. Salisbury, and G. Harry Stine. However, the Space Coalition never went any farther as an effective organization. Driggers and Ratiner dropped out, as did Salisbury later. Between his work on the Moon treaty and his efforts on behalf of the Space Coalition, Ratiner had put considerable time and effort into pro-space activity, at no small cost to his earnings (“I have put more of my personal money into the space movement than anyone,” he says). In the end, he concluded that there was no critical mass of serious people interested in space, and no real space movement. At the end of 1984, there was yet another effort to bring the pro-space community together. Under the auspices of the Aerospace Education Association, Brian T. O’Leary invited addressees of a direct mailing campaign to join the National Space Council, which was to speak for the entire space community and to publish the Space Newsletter. As of this writing, it is too early to tell whether or not this effort will share the fate of the NCCS and the Space Coalition. There have been other, more modest efforts toward merger or improved coordination. Bell noted that the World Space Federation and United for Space (both small, rather weak groups) merged into the L-5 Society and that Citizens of Space merged into OASIS. Several campus-based groups became chapters of Students for the Exploration and Development of Space. There also were plans for creating pools of resources, such as mailing lists, visual aids, and bibliographies. Two thirds of the organizations responding to Bell’s 1982 queries reported that they had cooperated with other space groups in some kind of joint project. One of the most positive examples was the sharing of mailing lists for specific lobbying campaigns, notably that conducted for the space station in late 1983 and early 1984. Leaders of the National Space Institute and the L-5 Society discussed the possibility of merger during 1984 and 1985. Clearly, the diverse interests involved in pro-space activity have found it difficult to coordinate their efforts, much less to merge. Catalyzing events, such as a threat to the space program, the arrival of a new administration, or the prospect of a major new space project, brought them into temporary cooperation, but the generalized desire to do something has proved inadequate to maintain effective coordination. In striving for consensus positions, the space advocacy has risked losing the support of one or more organizations. the new groups are having a bad effect on NSI (and presumably, on other established, active space organizations)…. I urge you to toss out solicitations from such groups, unless they have proved themselves. Having more groups is not good for the space program, because it ensures that no group will reach a really effective number of members. Interorganizational frictions have been heightened by personality conflicts and differences in operating style. The activists of the early L-5 Society in particular sometimes grated on people in older organizations. Conflicts between technological utopians and pragmatic engineers or critical scientists remain a familiar story to observers of pro-space organizations. These factors are sometimes intensified by the fact that many pro-space organizations revolve around a small nucleus of activists, in some cases one person. Citizens groups in general often depend on volunteers who are motivated by “psychic rewards,” not only by dedication to a cause, but also by a desire for recognition. One may need a stronger than average ego drive to persevere as an unpaid leader of a citizens activist group. One analysis of earlier American protest movements may add another dimension in suggesting that personal power was a significant motivation for many of their leaders. So it is with space. “There are more egos per square inch in the space movement than anywhere else I know,” says veteran space activist Charles Chafer. This common phenomenon may be intensified in the pro-space movement because of the transcendental element in the pro-space cause. There is a hint of immortal reputation in being visibly associated with developments of historic significance and open-ended promise. Several people have aspired to lead the modern American pro-space movement at one time or another, and there have been suggestions that the right individual could have brought it together. The names usually put forward are Wernher von Braun, whose background was controversial and who died before the pro-space phenomenon really blossomed; Gerard K. O’Neill, who many believe did not have the political skills required; and Carl Sagan, whose liberal political stance alienates him from many pro-space people and whose criticisms of the manned space program have not endeared him to groups such as the L-5 Society. As for organizations, the National Space Institute, the L-5 Society, and later the Planetary Society each may have had the chance to become the nexus of a pro-space movement, but none succeeded. Pro-space citizens groups have not coordinated successfully with other parts of the space interest constituency, such as the Aerospace Industries Association. The pro-space community remains without a joint organization, a single dominant leader, or a universally agreed platform. This is not necessarily fatal. The environmental movement, which has provided a model for the pro-space movement despite its much greater size, never coalesced into a single organization under a single leader. Its separate groups have been able to focus most of the time on separate agendas, occasionally forming tactical coalitions to deal with major questions. As of 1984, pro-space groups seemed to have a long way to go in learning coalition politics. This has reduced their impact in the political field. Trudy E. Bell, “Space Activists on Rise,” Insight (National Space Institute), August/September 1980, pp. 1, 3, 10. Testimony of T. Stephen Cheston before the Subcommittee on Science, Technology, and Space of the Committee on Commerce, Science, and Transportation, U.S. Senate, March 17, 1977. Reproduced in L-5 News, April 1977, pp. 2-3, 12. Nathan C. Goldman and Michael Fulda, “Outer Space Groups: Galaxies of Interests, Galaxies of Groups,” paper to be published in volume 2 of the Space Humanization Series (Institute for the Social Science Study of Space). This is based on an interview with Mickey Farrance, April 21, 1984, and on materials provided by the Hypatia Cluster. This is based on an interview with Dennis Stone and on materials provided by Spaceweek headquarters. On this early period, see Ron Jones, “UAL to Form Civilian Space Corps,” L-5 News, July 1981, p. 11. See David C. Koch, “Chairman’s Report: Circling the Wagons,” ASAP Update, April 1984, p. 1. “1984 Space and Aviation Camp a Success,” ASAP Update, June/July/ August 1984, p. 5, and “ASAP Activity Sparks Vitality, Growth in Oregon,” Lawyers Title News, July/August 1984, pp. 4-7, 17. David C. Koch, “Creating Tomorrow,” Lawyers Title News, July/August 1984, pp. 8-10. David C. Koch, “Chairman’s Report: Happy Birthday ASAP,” ASAP Update, September 1984, p. 1. David C. Koch, “Free Enterprise in Space,” ASAP Update, September 1984, p. 2. See Larry van Dyne, “Diamonds in the Sky,” Washingtonian, November 1983, pp. 164-71, 194-97. This section is based on conversations with Polly Rash, December 12, 1983, and Elizabeth Harrington, January 9, 1984, and on materials provided by the Society of Satellite Professionals. p. 36; Juana E. Doty, “Launching Private Space Fund Drive,” Los Angeles Times, July 20, 1982. Interview with Nancy Wood, March 13, 1984; also materials provided by The Space Foundation. On Arthur Dula, see Ron Bitto, “Cosmic Counselor,” Omni, August 1981, pp. 48-51, 94 and Arthur Dula, “Getting Involved With the Future,” Analog Science Fiction/Science Fact, July 1979, pp. 8-13. Based on materials provided by the Radio Amateur Satellite Corporation and on “Satellites on a Shoestring,” paper presented by Roger Soderman at the Second Annual Conference on Private Sector Space Research and Exploration, May 27, 1984. Based on an interview with Jesse Eichenlaub, May 27, 1984, and on materials from the Independent Space Research Group, including its newsletter Focal Point. See also “Amateur Space Telescope,” Astronomy, October 1980, pp. 59-60; Robert J. Sawyer, “An Amateur Space Telescope,” Sky and Telescope, August 1982, pp. 127-29; “Amateur Space Scope,” Astronomy, September 1982, p. 64; “Amateur Space Telescope Nears Completion,” Astronomy, March 1984, p. 60; “AST Camera Fund,” Sky and Telescope, April 1985, p. 312. See Chauncey Uphoff, “The First Solar Sail,” L-5 News, July 1981, p. 10. Based on an interview with Robert L. Staehle, February 6, 1984, and on materials from the World Space Foundation. Save the Apollo Launch Tower was described in “Help Save the Past,” Insight (National Space Institute), December 1983, p. 2a. Interview with Jim Heaphy, April 20, 1984. See “Big is Beautiful, Too,” Time, August 22, 1977, pp. 25-26 and “California Plans Space Program Symposium,” Aviation Week and Space Technology, July 25, 1977, p. 20. See “Jimmy C. Will Increase NASA’s Budget if Good Friend Jerry B. Will Take Permanent Space Walk,” L-5 News, April 1978, p. 2. As quoted in Stewart Brand, ed., Space Colonies (New York: Penguin), pp. 146-48. Press release from the April Coalition, February 25, 1978. Interview with Tim Kyger, November 28, 1984. See Jay Miller, “L-5ers Develop a State Space Program,” L-5 News, April 1982, pp. 2-3 and “Golden State Ready for Liftoff,” Insight (National Space Institute), December 1983, p. 3a. See Nathan C. Goldman, “Working for Unified Space Lobbying,” L-5 News, March 1981, p. 4. Much of this section is based on interviews with Mark R. Chartrand III, October 11, 1983 and with David C. Webb, October 13, 1983; also Bell’s surveys and materials provided by the National Space Institute. For an action by the ad hoc committee, see “Solar Power Possible,” Aviation Week and Space Technology, December 15, 1980, p. 95. Letter to President Reagan on National Space Institute letterhead, September 11, 1981. The author was present at the meeting. Trudy E. Bell, “From Little Acorns…: American Space Interest Groups, 1980-82,” unpublished paper. This section is based in part on interviews with Gerald W. Driggers and Leigh Ratiner. “Explanatory Note” from the files of The Space Coalition, kindly loaned by Leigh Ratiner. Letter from Gerald W. Driggers to Hugh Downs, June 3, 1980, from the files of the Space Coalition. Gerald W. Driggers and Rebecca Wright, “The Space Coalition: Bringing the Pro-Space Message to Washington,” L-5 News, July 1980, pp. 2-7. Letterhead of Space Coalition letter dated April 7, 1981. Trudy E. Bell, “From Little Acorns…:” unpublished paper. John Kenneth Galbraith, The Anatomy of Power (Boston: Houghton, Mifflin, 1983), p. 150. Mark R. Chartrand III, “From the Executive Director,” Insight (National Space Institute), November 1983, p. la. See “Sixties People,” Omni, March 1984, p. 41. Interview with Charles Chafer, October 6, 1983.